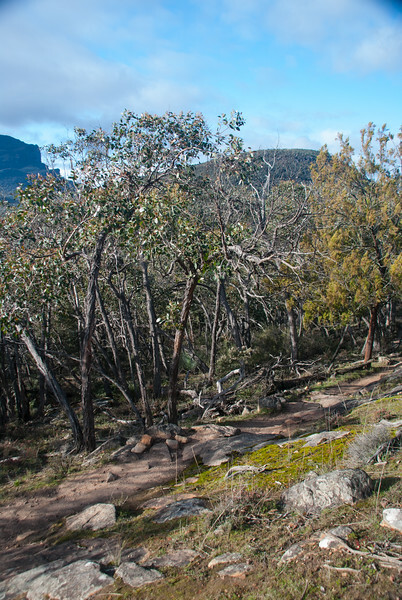 While I can say that this is one of my favourite Grampians walks – I’m also happy to confess one of the reasons I like it so much: it’s about the easiest hike in the entire the Southern Grampians. The path is firm sand and gently undulating, and when I say easy, I mean my 73 year-old mother managed to do most of it with a walking stick. And she loved it. 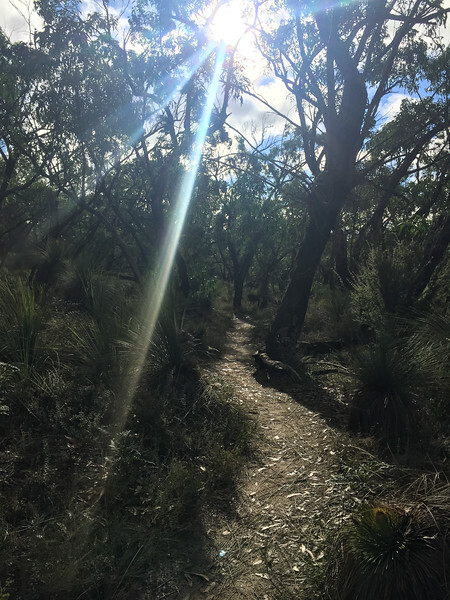 If you’re visiting the area for the weekend, or to soak up the arts or glorious regional foodie offerings, then this walk is just perfect for stretching your legs and soaking up a little nature. And maybe working off a few calories (just putting that out there). Don’t be put off by the name – we’re not actually climbing the mountain. 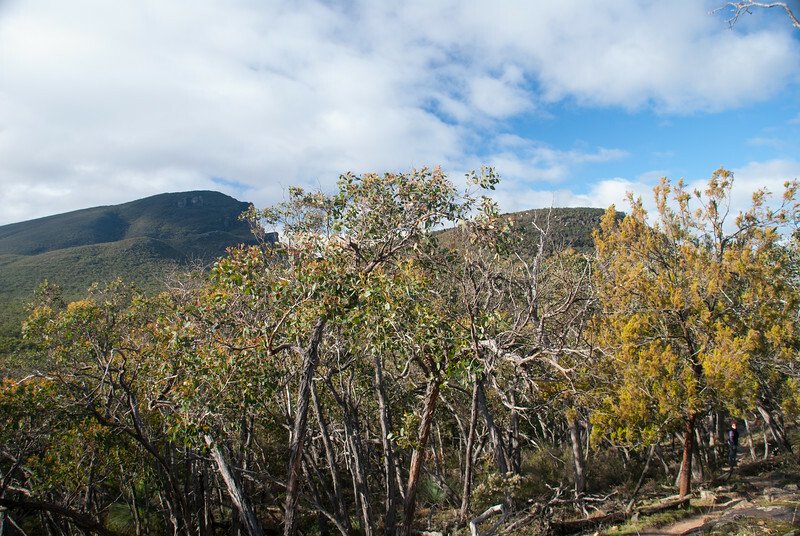 Visible for miles around, the gorgeous Mount Sturgeon stands like a sentinel watching over the village of Dunkeld. 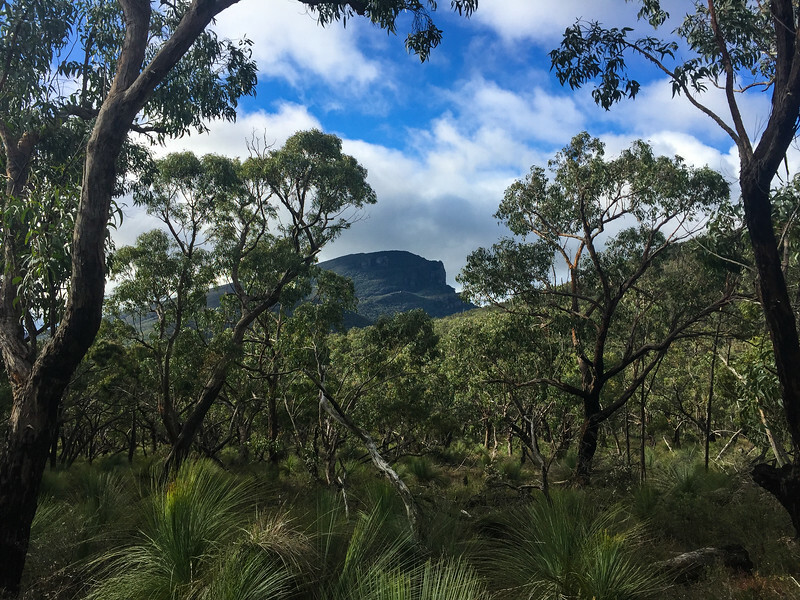 But as big as it seems, it’s a little hill compared to its close and imposing neighbour, Mt Abrupt – the highest mountain in the Grampians National Park. Starting from the car park, the path is very clear and easy to follow. It rises a little here and there, but gently. It’s also pretty dry, even after rain, as it’s well-drained. Within a few minutes, you’re away from the road and looking up at the baffling rock-face of Mount Sturgeon. The path to the top of this edifice follows the gradual rise up the ridge to your right – but don’t worry about that, as you won’t be going that far (unless you want to, of course). As you continue, the path rises a little, then flattens out, and rises a little more – but always gently. It’s not so much a workout as a brain-clearer. In every direction the sometimes sparse bush leaves open into secret alcoves, or snippets of more distant views. Nearby Picinini and Mt Abrupt feature heavily. If you step off the path a little, you can get some very clear photos of both. All along the way you can see spots of colour or bright white clusters of flowers and lichen. 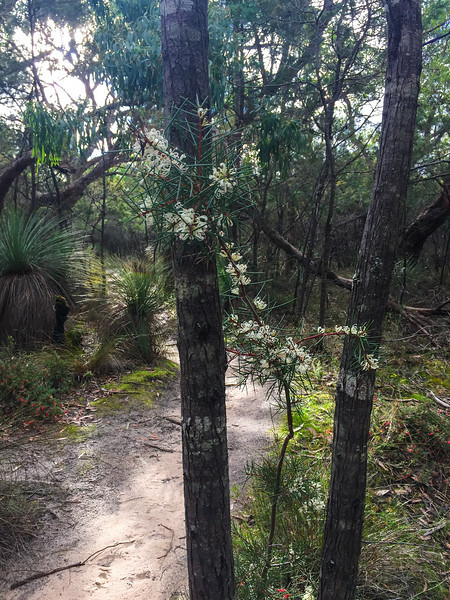 There are eerie burnt-out trees, spinifex, rosellas squawking in the branches and I’ve even seen an echidna and a wombat slowly going about their business close to the track. As with any walk, you can stop and turn around whenever it suits you – but for this walk, I like to continue a bit further once the climb up the ridge starts. Here there are a few rock steps and the path rises more steeply than before – but it’s not hard work at this point. 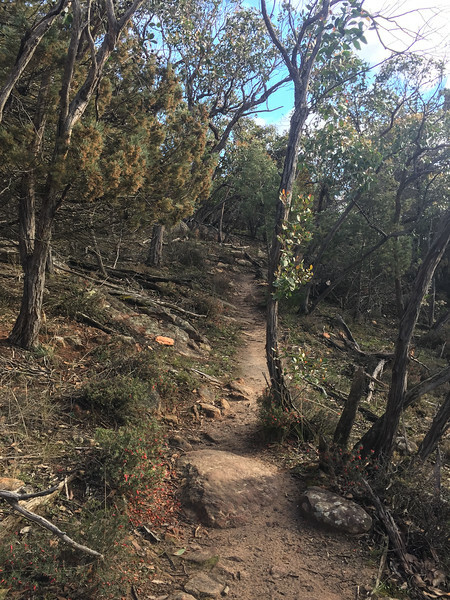 If you continue for about 20-30 meters, you reach a sandy boulder outcrop and you’re rewarded with an enormous panorama of Victoria Valley, Mt Abrupt and the imposing ridge of mountains north. It’s quite a sight. And the perfect point to turn around and head back. Alternatively, if you’re feeling fit, adventurous and you have sufficient supplies, you can continue up to the stop of Mount Sturgeon. The views are incredible! 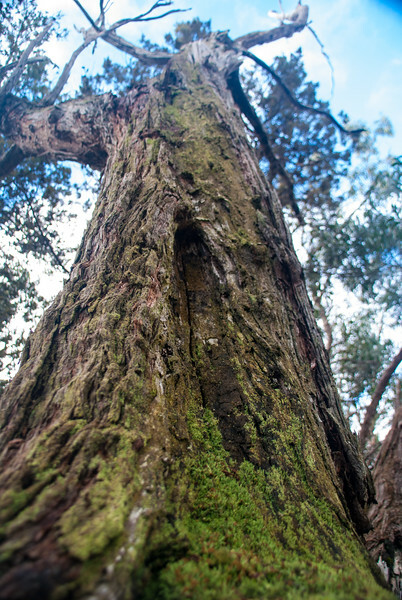 And the best thing is, once you finish your wander through the glorious Grampians, there are any number of great spots in Dunkeld for you to grab a restorative coffee. Okay, and a little cake as well. Let’s face it – you did just walk off a few calories, right? From the Tourist Information booth in the centre of Dunkeld, drive east along the Glenelg Highway for a hundred-ish meters then turn left into Victoria Valley Rd. Around 1.5km along the road you’ll find the Mt Sturgeon Walk Car Park on your left. Make sure you take water with you, and a jacket – as mountain weather can sometimes be unpredictable. This walk is good all year round, as there’s plenty of shade in summer. Just make sure you have water if you’re going on a hot day. A morning walk will give you better photos of Victoria Valley. An afternoon walk will give you better photos of Mt Abrupt and Picinini. If you do take this walk, please come back here and let me know what you think.